Ingrown toenails can be a nightmare for those affected. A seemingly innocuous problem, they can cause you undue pain and discomfort besides making your feet look unsightly. When you have ingrown toenails, your nails begin to grow into the skin instead of over it. Thankfully, it is possible to get rid of ingrown toenails permanently with the right combination of care and treatments. What’s even better is that many of these remedies are quick and easy to administer and can be done comfortably at home or anywhere on the go without the need for prescriptions or specialist help. What’s most important when it comes to ingrown toenails is tending to the problem as soon as possible to prevent things from getting worse or letting an infection spread further. Here are some pointers to help you diagnose and treat the problem with the best treatments for ingrown toenails and home remedies that will help you get rid of ingrown toenails for good. If you are diabetic or have health issues like vascular problems, you need to nip the problem in the bud as infections and risk of complications could even cost you a limb if left untreated for too long. Always consult your doctor if you have such medical conditions, alongside using home treatments for ingrown toenails. If you’re unsure if the problem you’re dealing with is a case of ingrown toenails, here’s some help with spotting the symptoms. If you notice any of these issues with your nails, chances are you’re dealing with a case of ingrown toenails. 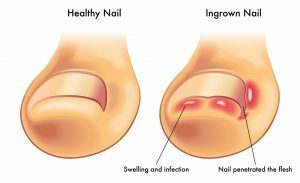 If there is pus from your ingrown toenail or you’re feeling feverish, experiencing shivers or feeling hot, do contact the doctor – your ingrown toenail might be infected. Touted to be the most advanced treatment for ingrown toenails, Meditex Uriel Ingrown Toe Nail Drops help get to the heart of the problem. The remedy contains aqua or water along with Lavandula Angustifolia or lavender oil, and Sodium Thiosulfate, Sodium Hydroxide, and Laureth-4. Simply apply them to the affected toenails twice a day using the special flat applicator that’s designed to fit between the skin and nails, taking care not to let any get on the skin surrounding the nails. These toenail drops help soften the tissue that’s embedded as well as any calloused tissue. Doing this prevents the development of an ingrown toenail. You should see a marked difference and notice your toenails start to straighten after using these drops. The best part is they don’t require a prescription, so you can fix the problem without running up huge bills from seeing the doctor. Most people find relief within just a few days of using the topical remedy. CurveCorrect Ingrown Toenail Home Treatment is another great choice to treat ingrown toenails. This remedy contains tiny toenail braces which are to be worn on your toenail to correct excessive curvature of the nail- the main reason you develop ingrown toenails. Users of the product swear by it, saying it helps get rid of pain from ingrown toenails in as little as 1 to 3 days! The product is Made in USA and offers US-based product support, so you can be sure that help and guidance and answers to any questions you might have are just a phone call away. This remedy comes with a 90-day guarantee and is well worth a try. A single kit has ten transparent braces. This treatment is a great alternative to surgery and more reliable than many other remedies. You simply apply the composite strip across the expanse of your toenail. Once bonded to your toenail, it begins to apply a gentle force like a spring, causing the nail to slowly straighten. 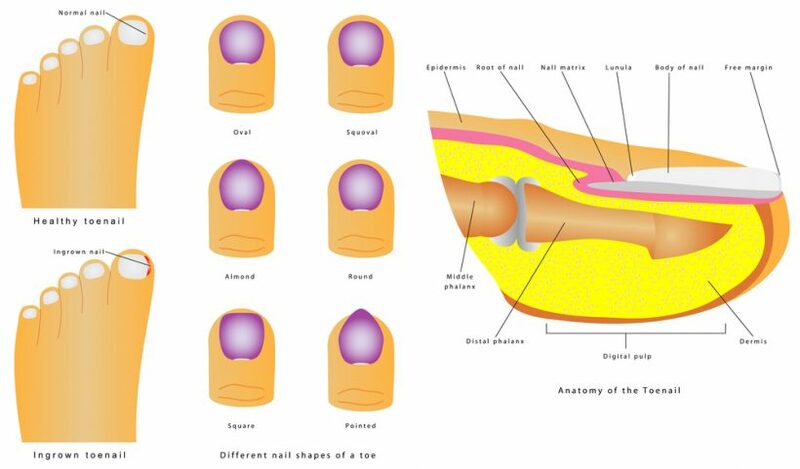 Any pressure you might have experienced to the sides of the toenail is effectively done away with. Will Ingrown Toenails Cause You Problems? those with health problems like diabetes. Impaired blood flow to the feet and nerve damage in the area can get infected quickly. Injuries like ingrown toenails won’t heal as quickly as in other people either. If you wind up with an open sore or a foot ulcer, you might even need surgery to avoid gangrene(tissue death and decay). When the tissue over the nail continues to grow over your toenail, it can bring on long-lasting and even permanent changes to your tissue. This can result in further swelling, worse pain, and infection. So, once you’ve identified the symptoms of ingrown toenails, do try and attend to it right away. Failing to do so, even if you’re in otherwise good health, may cause the underlying bone to become infected in some cases. If this happens, you might wind up with a serious bone infection. Why put yourself at risk of such problems when there’s a range of simple home remedies and effective prescription-free treatments readily available in the market? Soak your foot in clean warm water several times a day (3 to 4 times is ideal). Ensure your feet are dry except for when you’re soaking them. Any moisture the rest of the day must be avoided. Wear open sandals to reduce pressure on the toenail until it heals. If you need to wear shoes, make sure they are roomy in the front so there’s plenty of space around the toes. Simple over-the-counter painkillers like acetaminophen or ibuprofen can help ease the pain. If you don’t see any change in the condition or if the pain or symptoms seem to get worse, do get in touch with your doctor right away. Those with medical conditions like diabetes and vascular problems should be particularly careful and alert their doctor soon. If you have a badly infected toe, you might need a course of antibiotics prescribed by a doctor. If the problem is linked to a fungal infection, appropriate treatment will be suggested. Now that you’re armed with your first line of defense, you should be able to tackle the problem of ingrown toenails smoothly and efficiently in the comfort of your own home. Consider trying out remedies like Meditex Uriel Ingrown Toe Nail Drops or CurveCorrect Ingrown Toenail Home Treatment to deal with the problem swiftly and spare yourself any further pain or discomfort. ← Can I Get Fungus From a Pedicure?